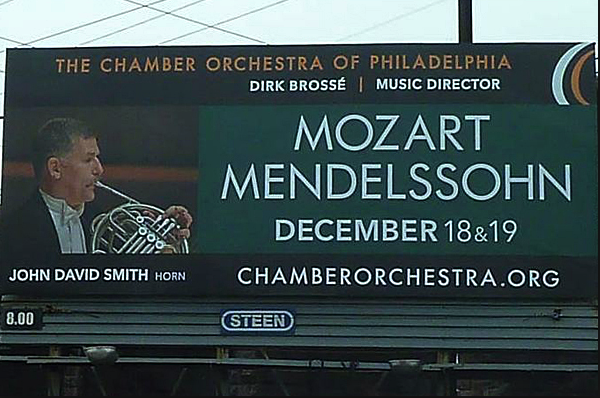 As you drive along the Schuykill Expressway or 95, have you seen the billboards inviting those who survive their commute to attend an upcoming Philadelphia Orchestra, PCMS, or Opera Philadelphia performance? It’s good to see this kind of aggressive marketing to potential new concertgoers. 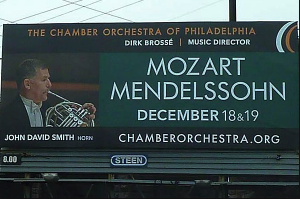 But have you noticed that the signs tend to advertise a single event, say La Traviata at the Academy or an all-Beethoven program from the Chamber Orchestra of Philadelphia? Well, that’s because musical organizations are learning that younger audience members are not necessarily allergic to classical music—what they don’t like is subscribing and thus committing blocks of time that may be months away. I learned this bit of information from Maud Lyon, the Executive Director of the Greater Philadelphia Cultural Alliance, when she spoke at a board meeting of The Presser Foundation in September about the challenges facing musical non-profits. This phenomenon is a potential problem, as it can make it difficult for arts organizations to plan when they really don’t know ahead of time what their revenues from ticket sales will be. And it affects marketing strategies, as with those billboards. Music subscribers declined in Philadelphia by around 22% from 2009 to 2012, which represents around 6000 people. I assume that 22% number doesn’t mean that 22% fewer seats are being sold—just that people are making their decisions to attend on a concert-by-concert basis. Frankly, I’ve always found I make it to more events when I sign up for a series, and can’t justify staying at home and blowing off the expenditure. At 6 PM, after a long day’s work, going to a concert may not necessarily seem like a better idea than stretching out with a good book but, inevitably, when exiting the hall after a good performance, I’m glad I’d made the decision to go. But if you’re an arts organization, I guess you’ve got to go with the flow and respect all the competition there is for an individual’s time in our information-saturated environment—especially if you’re younger with work and a family. Building new audiences is more challenging than ever and a variety of approaches do need to be explored. Fortunately, in Philadelphia we’ve got a lot of great “product” and, once a newer concertgoer has made it to a few performances, hopefully they’ll be hooked.